We bring immersive experiences to the smaller screens, which translates into better governance, streamlined operations and customer engagement with our exceptionally rich understanding of the mobile technology. We have a rich expertise in creating Government-to-Customer & enterprise mobile apps that empowers government for citizens. Our deep understanding of technology and rich experience in E-Governance helps us to deliver an unmatched experience in government interactions with citizens (G2C), businesses (G2B), and employees (G2E). Our mobile apps facilitate the government to coordinate between departments and ministries (G2G), hence boosting the quality of services and management of resources to ensure convenience & transparency within the system. With the growing focus and need for mobility in Government departments, we empower ministries, PSUs and other public figure adapt to the mobile age. We work with you to ensure that the applications we design and develop translate your vision into reality. Our experts develop feature-rich and engaging apps for the world’s most advanced mobile operating system. Our innovative apps let you enter into a new world of great experience of augmented reality and virtual reality apps along with the high convenience of AI. One of the best reasons to go for iOS platform is its unmatched quality for its heightened user experience. We are leveraging scalability, flexibility & agility of the world’s most eminent and used mobile app platform. Our experts develop Android apps that are close to your specifications making it more powerful, intelligent allowing a great room for customization. With its maximum user adoption, Android is way easier to work with Software Development Kit. SDK makes development and licensing cost to the minimum and is well embraced by the Android community. 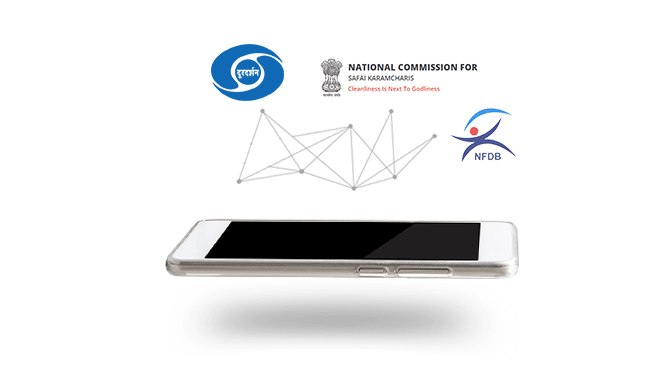 We take great pride in developing a high-end mobile application for Subsidy Management, National Fisheries Development Board and mobile application for National Commission for Safai Karamcharis and Ministry of Social Justice & Empowerment. We have also been actively involved in developing the next-generation mobile application for Doordarshan where we’ve showcased content for 16 Regional channels and 7 National channels. Our upcoming projects include Mobile Application for Land Records Management for PSIEC, Chandigarh and many more are in the pipeline.